Retail $14.36 SAVE 30% ! Good basic varied set of colors. tray is useful for keeping set organized together. The brush it comes with is usable but basically worthless. You should get pipettes and thinner to get full use of all the paint, as it dries out and you lose about 5-10% of the paint. This is an essential set of the primary (& some others) colors needed to paint model kits with enamels. With these hues, you can also easily create needed hybrids like orange and pink. The box is also great for storing 9 jars of of paints and shaking them up safely! Do keep in mind that enamels do not mix (well) with acrylics. 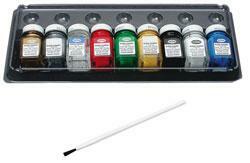 It&apos;s a good set of paints comes with basic colors description was accurate.